The home life of the majority of our 2002 diarists was the most important part of their day, with food being central to their concerns, but how does the food eaten now compare to some of the Victorian recipeswe have? There are many domestic tips from the Victorian era to be seen but how has life been made easier in the modern home? And how does the great event of the Victorian household - washing day - compare to the modern chore? 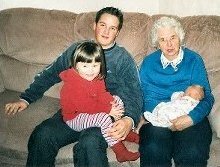 One 2002 housewife compares her life with that of her mother, born in 1902, and others describe the care of young children, their gardens and their homes - improving them and maintaining them. What clothes were being worn by people in 1891? There are many pages from the Pryce Jones mail order catalogue from that year, but also many pictures of Powys families - the Beards, the Hobbys, the Lomaxs, the sad picture of little Annie and Henry, and most of all the beautiful but anonymous album of photographs from the Brecknock Museum and Art Gallery.